Another week, another invasion of privacy and violation of rights for regular citizens. It's becoming quite an alarming routine from the Obama administration, isn't it? The latest "Are You Kidding Me?!" story is how the NSA has been collecting records from tens of millions of Verizon wireless customers in the U.S. under a top-secret court order, including "the numbers of both parties on a call are handed over, as is location data, call duration, unique identifiers, and the time and duration of all calls." We have established legal procedures wherein the government can go to a judge, explain why they believe some type of unlawful conduct is happening, and get a warrant to get your phone records, tap your phone, search your home, etc. However, in this case, there was no underlying conduct or suspicion thereof that would give a judge cause to grant such a warrant. There were no allegations that specific Verizon customers were communicating with terrorist organizations or conspiring with criminals; the government just wanted a database with all of these records from tens of millions of private citizens. Accordingly, I believe very strongly that this was an egregious violation of the due process rights of the Verizon customers. 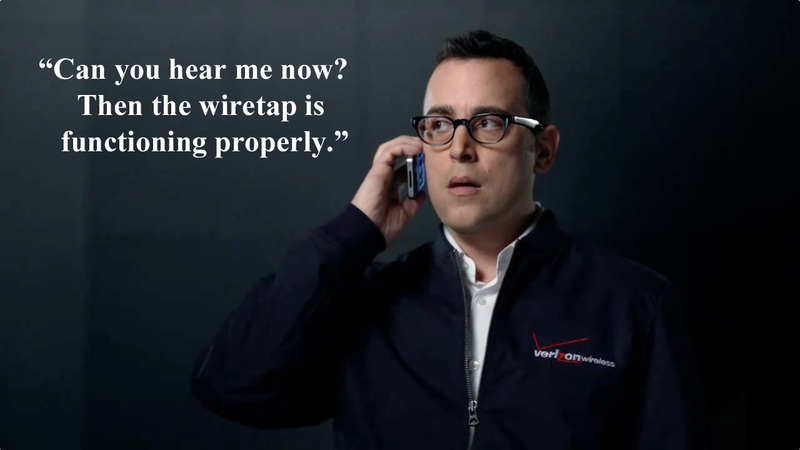 Based on the reactions I'm seeing online, a lot of Verizon customers are not happy about this widespread invasion of their privacy. Many are making jokes along the lines of "now the government knows exactly how often my mother calls," but there is an underlying discomfort and anger because for the average American citizen, if you have done nothing wrong, there is simply no reason that the government should know how often your mother calls. Except as otherwise required by the duties of your position, you must not - and must not permit others to - access, listen to, monitor, record, tamper with, disclose or intrude upon any customer conversation or communication, except to comply with a valid service or installation order, a valid legal order or applicable law, or for the limited purposes of quality monitoring and training, as approved by the Legal Department. Note that they mention "comply[ing]...with a valid legal order or applicable law," but don't clarify what the customer should be told about such compliance. Again, note that they list the information they are gathering from their customers, and expressly states that they will "inform you about the information we collect, how we use it, and your options with regard to that collection and use," but somehow Verizon's "we will inform you" promise doesn't cover turning over data on all your communications to the government. This story just broke within the past 24 hours, and I'm sure there's more ugly details yet to come. What I do know for sure is that I do not envy Verizon's legal and public relations departments this week. Hopefully the blowback is harsh enough that it serves as a lesson for other companies that capitulating to government demands to violate the privacy rights of their own customers is a bad business plan. It will be interesting to see if any of the other major wireless carriers were also handing over databases of customer communications to the government under similar secret orders. For more information on this story, read Glenn Greenwald's original exclusive report here, Mary Katherine Ham has a thorough summary of the latest breaking news here, Conor Friedersdorf has an excellent analysis at The Atlantic on praising the whistleblower who exposed this story here, and Seton Motley has an excellent post at RedState on why big government is the problem here. UPDATE I: I've been having some excellent debates with people on Facebook and Twitter, and wanted to clarify a few points. First, yes, I get that these were orders from a secret court. But holy heck, if a government order violates a constitutional right, issuing it from a secret court doesn't make the constitutional violation go away. In fact, in some cases that makes it all the more crucial to challenge. Also, going to court isn't Verizon's only option. The company spends major funds on lobbyists and if this issue was a priority for them, they could lobby to change the law or the procedure for how it is implemented. Bottom line, it is absolutely inaccurate to say that Verizon didn't have any options but to fully and immediately comply with the government's demands for their customers' information. UPDATE III: Apparently that's a story from 2006. Or something. Whatever. The government is creepy and invading our privacy, and they're doing it a lot and in a lot of different ways. Ugh. Most. Optimistic. Local. News. Station. EVER.